I'm pretty rubbish at looking through the FG inbox but sometimes I manage to look back at some old submissions. 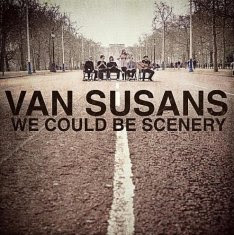 Van Susans were the lucky lot to capture my attention this time round, with the rousing 'Get Up, Get Out' proving to be the stand-out highlight of their summer EP, 'We Could Be Scenery'. Listen to the track and the debut EP below. The EP itself is something of a mixed affair but buried amongst the lad-rock meets piano-pop is the anthemic 'Get Up, Get Out'. The track itself isn't such a departure from the other songs on the EP but it seems to resonate more with its simplistic call to arms/party - "sleeping's just such a waste of time". It might not be particularly profound but it is a wonderfully layered pop song. Which just about makes up for their dubious biography page. 'We Could Be Scenery' is available to purchase from Amazon.co.uk, Bandcamp etc. Head to vansusans.com for more on the band.